Things change everywhere, even here. 1963. Lake Charles, Louisiana. 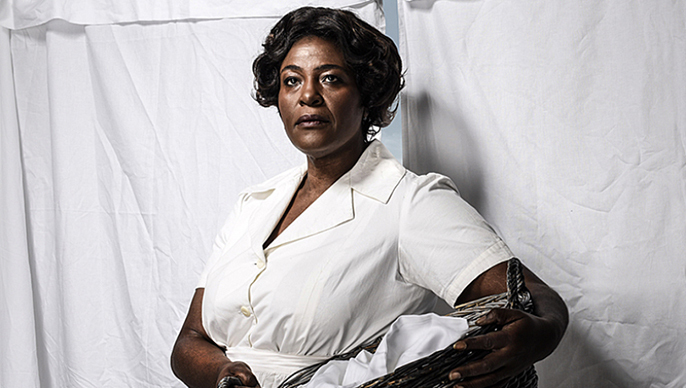 Caroline Thibodeaux is an African American maid earning thirty dollars a week working for the Jewish Gellman family. She is a single parent and the mother of four children. Eight-year-old Noah Gellman visits Caroline in the basement as she works, washing and ironing. But when the boy begins leaving loose change in his laundry, his stepmother Rose devises a deterrent with revealing and far-reaching consequences. This Olivier Award-winning musical mixes blues, soul, Motown, classical music and Jewish folk songs to create a beautiful, uplifting and deeply moving portrait of America at a time of momentous social upheaval spurred by the civil rights movement. The Broadway production was re-staged at the National Theatre in 2006; this will be the first new UK production. Author of the ground-breaking Angels in America, Tony Kushner’s book and lyrics were partly inspired by his own boyhood. The score is by Jeanine Tesori, whose musical Fun Home won the 2015 Tony Award for Best Original Score. Michael Longhurst, who recently directed an acclaimed revival of Amadeus at the National Theatre, directs Sharon D. Clarke in the title role. Equally renowned as a singer and actor, her Olivier Award-winning stage and screen work encompasses Ma Rainey’s Black Bottom and The Amen Corner at the National Theatre, Ghost the Musical and We Will Rock You in the West End, and Holby City on TV.